Who collects all of these strange and unusual facts, and how do we know if it is true or not? I love odd bits of trivia, and it is good to arm yourself with useless knowledge when someone starts talking politics. My love for strange and unusual facts comes from time spent working for the US Senate as an intern. I didn’t have a wink of cash (the job is glamorous, cough cough, but doesn’t pay well). The free City Paper in DC is a great source of information, is totally entertaining, and, ahem, it is free. It reproduces a syndicated column called “News of the Weird,” and I loved reading the column while standing on the Metro. When things got heated around the water cooler, it was prudent to whip out a useless fact like, “Hey, Julie! Did you know that you can potty train farm pigs?” This would lead to a discussion of the News of the Weird and the fighting duo or trio would be averted once again. But what is most awesome about News of the Weird is that everything is TRUE. The site is so well maintained that they move articles that aren’t so weird anymore. They verify their information through police reports and other standard research documents. So, the information is both weird AND true. Sweet. People that die because of stupidity are the main focus of this site, but they also cover near deaths, too. I love the site because it tells you if a story is true or an urban legend. Another place to get strange information is at StrangeFacts. While the overall graphics of the website are really chintzy, they have had some decent press by newspapers like USA Today. This one almost didn’t make the list because it is hard to tell what is true and what is bumpkus. But, it is worth a mention because of its “strange laws” section (which tells you not to believe everything you read). Okay, let’s assume you aren’t into weird and morbid facts. There are lots of great places to just get odd sorts of information. InterestingFacts is the best documented and diverse site among them. 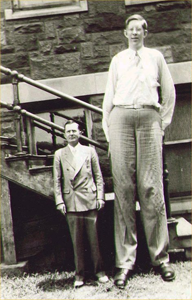 You can browse through their different collection of facts (tallest man ever, pictured above) and you can submit a new fact, too. They verify the facts to make sure they aren’t bumpkus and then post them on the site if they are legit. The random nature is a hoot, too! The final site worth viewing is a reference site called Strange and Unusual References. What I love most about this site is that there are strange and unusual facts here that aren’t found on any other site. Seriously….all vowel words? Another piece of virtual goodness is that this site seems to aim at teaching you something. For example, I learned about the difference between a blank map and a blank page in an atlas. Sharing strange information is a great way of bonding, but be sure to get your facts straight before running off to seek fame and fortune. It might be true that “truth is stranger than fiction” but it is up to the reader to be sure that the truth is, well, true! Hunting down strange (but true) information is tough. Do you have any weird sites to share? I request you to add one more website to this list. You can cross verify. Did you know that in New York is forbidden jumping from buildings. And the offense is punishable by death (go figure). But, is the veracity of the info provided verified by these sites? Thanks for the comment, Haresh. In the sites I reviewed, I specifically looked for "truth in telling" and believe that they do, to best of their ability, research claims. When there are questions, the site writers ask them, and they seem to want to distinguish urban legend from fact. I am not sure of the veracity of the sites posted in the comments. thanks!!! i jst luv weird stuff and science!!! Awesome! I'd add oddee.com to the list.